Total Ht = 183; [.1] Ht = 180, rim diam = 67.5 x 63.7, max diam = 86.5 x 83.5, base diam = 80.5 x 78, wall th = 5, handle W = 6.5, handle th = 4.2 mm; [.2] L = 68.5, W = 67.2, ht = 39, wall th = 1.8 mm [RTS 17/5/2005]. Brian John Mack (known as John Mack). Wooden container [.1] and matching lid [.2]. The body has been carved out from a single piece of wood, with a well-hollowed out interior and cylindrical body consisting of a narrow flat-topped, upright rim, tall upper body with concave sides and cylindrical lower body with an open, roughly circular base. The wood is a warm orangey to yellowish brown colour (Pantone 722C), and has a strong organic smell that suggests it may have been used as a container for dairy products. The interior walls also look greasy. The lower half of the container has been covered with a tightly fitting yellowish brown hide sheath (Pantone 7510C) that extends over the opening in the wood to create a flat base. This has no vertical seams, and has probably been taken from a tail section of a large animal, stretched over the wood when wet, then shrunken to fit. There is a raised ridge running around the centre of this hide section, created by a row of stitching, although it is not clear if this was done to fasten 2 pieces of hide together around the circumference, or purely for decorative effect. A hide handle has been attached to this ridge, on either side of the container, made from 2 narrow strips perforated along their lengths and interwoven to form a herringbone plait; the resulting piece has been doubled over to form the handle. 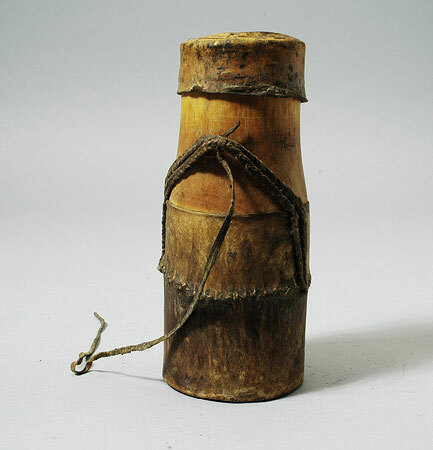 This passes up either side of the vessel, through the top edge of the hide cover, and then bends over to form a loop at the top that extends only halfway up the wooden neck of the vessel. There is a third strip binding it together at the centre and leaving one long end hanging loose. The container is complete and intact, with a weight of 214.5 grams and a height of 180 mm; it has a rim diameter of 67.5 by 63.7 mm, a maximum diameter of 86.5 by 83.5 mm and a base diameter of 80.5 by 78 mm; the walls are 5 mm thick while the handle is 6.5 mm wide and 4.2 mm thick. The lid has been made from a single piece of hide with similar colouring to that used on the body, and occasional traces of buff animal hair visible on the surface. This has been formed using a tandu moulding technique that shaped the lid directly on top of the container's mouth and neck while wet. It is roughly circular in plan view and slightly concave sides and a flat upper surface; the latter undulates slightly, suggesting that this part of the object had dried unevenly. The edge of the lid has been pushed up to form a slight recess on one side, directly above the top of the handle; this may have been done deliberately to help position it correctly. The lid is complete and intact, has a weight of 10.2 grams and is 68.5 mm long, 67.2 mm wide and 39 mm high, with a wall thickness of 1.8 mm. The lid and body when put together have a total height of 183 mm. This object was collected by Brian John Mack when working amongst the Toposa in the Southern Sudan in 1980. It appears to have been accessioned retrospectively as part of Patti Langton's collection later that year, using the same group number assigned to material from her 1979 expedition, which Mack had been a part of. However his 1980 fieldwork appears to have been undertaken independently of Langton, although she was working amongst the nearby Boya at the same time (pers. comm. John Mack 8/10/2004). Discussions of the Toposa may be found by Captain G.R. King in L.F. Nalder (ed. ), 1937, A Tribal Survey of the Mongalla Province, pp 65-81 and A.C. Beaton, 1950, "Record of the Toposa Tribe", Sudan Notes and Records XXXI . The Tandu technique is a method that involves moulding the inner skin layers or membrane of hides over a core (see H. Balfour, "Tandu Industry in Nigeria", Essays Pres. to Seligman). Accession Book Entry [p. 185] - 1979.20 (.1 - 206) P[urchase] MISS PATTI LANGTON, DEPT. of ETHNOLOGY & PREHISTORY, OXFORD. Collection made by Patti Langton during the British Institute in East Africa's expedition to the Southern Sudan; Jan. - April 1979. The collection was made in three culture areas during the dry season. The amount paid for each object is listed if the information is known. In Jan. 1979 £1 is equivalent to 95 piastres (pt.) Sudanese. This documentation is based largely upon Patti's own list of objects and her notes on these. Sometimes objects included in the Pitt Rivers alottment of the collection do not appear on her list and have been added here. See Related Documents file as well. [p. 214] 1979.20.194 - SOUTHERN SUDAN TOPOSA Collected in 1980 and sent via John Mack, Mus. of Mankind [p. 214] 1979.20.200 Wooden vessel covered with skin by tandu technique, and with a tandu lid. Plaited leather carrying straps are sewn on. H with lid = 18.2 cm. ; Diam. mouth = 6.7 cm. Additional Accession Book Entry [below accession number in red biro] - A6-F25-5. Card Catalogue Entry - There is no further information on the tribes catalogue card [RTS 23/7/2004]. Pitt Rivers Museum label - S. SUDAN. TOPOSA. Wooden and tandu vessel. Coll. by Pat Langton 1979.20.200 [plastic tag with metal eyelet, tied to object; RTS 6/4/2005]. Written on object - Toposa [RTS 6/4/2005]. Sparks, Rachael. "Toposa vessel" Southern Sudan Project (in development). 03 Jan. 2006. Pitt Rivers Museum. <http://southernsudan.prm.ox.ac.uk/details/1979.20.200+.1+.2/>.